The first big Trump play has arrived. It has taken a couple of years for writers to get to grips with the political rollercoaster that both the UK and US have endured since those key votes in 2016 separately plunging both nations into the most extraordinary debacles of the modern era. While our own experience of the Brexit chaos is so fantastical you would never believe it in a play, attempts to examine it openly are still so driven by emotion that incendiary debates rage about the role of art in reflecting politics, history and society as it unfolds – as James Graham discovered with the polarised response to his Channel 4 drama Brexit: The Uncivil War. These issues are, some would argue, are too sensitive, too incomplete to begin to make sense of so instead we subtly nod to them through allusion, inference and by drawing loaded parallels with classic texts. Whether or not you agree with that, Trump’s presidency has left a clear imprint on theatre land even when the show in question is not directly related to him – Jon Culshaw’s impression in a Harold Pinter monologue from the 1980s during the first outing of the Pinter at the Pinter season, or a demigod-ish Caesar at The Bridge Theatre channelling the stylings of the Trumpian electoral campaign. Yet a full-length play inspired entirely by the man himself and the America that made him has taken time to emerge. First out of the starting gate is Anne Washburn’s Shipwreck, opening this week at the Almeida, a 3.5-hour monster of a show that attempts to unpick the US mindset which led to Trump’s shock election and a particular kind of middle-class inertia and complacency that failed to recognise the signs and act to prevent it. Shipwreck is a huge undertaken, looking at politics, class, wealth and race as well as the small stories of friendship, parenthood and identity. If it sounds ambitious then it is, but the result has a baggy and often incoherent messiness that never quite manages to live up to its own expectations. The play’s sprawling structure is initially its biggest asset, a collection of friends – presumably old College buddies, though we’re not exactly sure – gathered at the newly acquired farmhouse of couple Richard and Jools. As each pair arrives, the intellectualising begins as they debate core moments of the last two years at the White House, pushing each other on points of disagreement and in several cases wrangling over a determination to have the last word. As these arguments play out, there is something of Annie Baker in Washburn’s approach, big conversations that seem to be about nothing but collectively reveal so much about the American psyche and the complexities of everyday life for working people. The hope of eventual coherence keeps you watching, although a number of viewers made their escape at the interval. Yet, the show fails to offer any notable or really new insight on the first two years of the most alarming President of modern times. Washburn’s play is a rambling essay of known facts, a polemic that charts some of the key events but fails to deliver a solid argument or even to demonstrate its credentials as a theatrical rather than a scholastic experience. Shipwreck’s very discursiveness should eventually coalesce into big themes and concepts as well as insightful and representative character portraits of the assembled group. This dilapidated farmhouse should be a microcosm of America but struggles to be anything other than a lightweight narrative about some fairly smug affluent people who like to argue. The big failing of Washburn’s play is that these many hours of talking result in two rather obvious conclusions, first that Trump lies and second that no one who votes for him really cares – well, you don’t need 3½ hours of theatre to tell you that. Dramatically, what plot there is, as the group survive a cold night, miles from anywhere, is driven by the supposedly shocking revelation that one of the characters voted for him, not as an act of sabotage in a safe seat but as a deliberate act in a purple state because they decide that Trump is the President America deserves. There’s something of the confessional in the way this is suddenly revealed but Washburn fails to properly draw these characters and their group identity, so when it comes to it this “major” revelation barely registers – the audience just don’t know or care enough about these people to feel the level of shock they experience. There is a laboured verbosity in how these characters interact with one another, long, complex sentences, the product of rehearsed debate that never sound remotely spontaneous and undermines the reality of the characters. And while there’s something Sorkin-esque about this approach, the play lacks the intellectual clout that makes his work so compelling, so with each scene built around a different point of contention it all becomes a bit a Dawson’s Creek meets The West Wing. In lieu of real characters, there is instead an excellent group of actors that do everything they can to keep the show alive despite the rather thin material they have to work with – like assembling The Avengers only to tackle a parking dispute – they absolutely carry the show. As the play opens, the scene is set by Raquel Cassidy’s Jools welcoming her tired friends to the inexplicably understocked and ramshackle farmhouse that she and husband Richard (Risteárd Cooper) are renovating. There’s something frail and homely in Cassidy’s performance, a woman who is hiding from the world, offering to bake cookies and lighting candles. Later, rather out of the blue, she argues frantically with the person who voted for Trump, but the play never shows us what her former, possibly waspish, life was and why this pivotal meeting of such different friends is really taking place so far from New York. Adam James is never less than compelling, and in Shipwreck he brings a sardonic texture to lawyer Andrew who retains his faith in cool logic however impassioned his friends become. But more than the others, James shows us something deeper beneath the surface, a hint of self-knowledge about the protection his privileged lifestyle affords with partner Yusuf as part of the New York elite, troubled by the direction of his country but rational in the weighing-up of facts and emotions. Khalid Abdalla’s Yusuf does well with some big confessional speeches that speak to the association between liberal privilege and Trumpian wealth protection polices, if only his character was anchored enough in the show to make these more meaningful. The rest of their friendship group is made-up of stereotypes, the poor hippy couple Jim and Teresa implausibly arriving almost immediately from the birth of their first grandchild and activist Allie whose recitation of Trump facts and realisation of her own failure to act initiates most of the debate. How these people have remained friends given their vastly different social spheres is problematic and unlikely, but the performances from Elliot Cowan, Tara Fitzgerald and Justine Mitchell make them all potentially interesting perspectives on the effects of Trump if only the play could have grounded their lives more convincingly. Out on his own, monologues from rising star Fisayo Akinade tell a not-quite complementary story of Mark’s childhood, adopted as a boy by white parents and raised in the same farmhouse the liberal New Yorkers now occupy. The experience of inter-racial families, how Mark came to view his own skin colour and his later exploration of competing ideas of black heritage are interesting discussion points which Akinade delivers well. These scenes are accompanied by Cooper and Fitzgerald as Mark’s parents Lawrence and Laurie, who talk about the immigration issues that had long led to Trump’s election, but the three stories never fuse effectively enough to be a truly insightful or meaningful assessment of America’s fate. Rupert Goold unites the domestic and the political by staging the whole thing on a big round Arthurian table, at which both the actors and audience members sit. For much of the play, the table top becomes the performance space bringing the action more into the laps of the viewer than the tiny Almeida stage normally allows. This idea was used very effectively in a version of King Lear at the Union Theatre some years ago where the battlefield and the political arena became the same space, and for Shipwreck it is an equally useful metaphor for the ways in which societal power intrinsically affects the everyday. It is a shame that some of the other aspects are less subtle including two rather ghastly fantasy sequences, played like cartoons in which Donald Trump (Cowan) confronts first George Bush (Akinade) and then James Comey (Abdalla). These horrible missteps again show us things we already know, that Trump reimagines his own history to paint himself as the knowledgeable hero and that he sees his unlimited power in terms of who is for and against him – also reiterated in several allusions to God and religious painting that dominate the projected backdrop. In an otherwise straight production that is entirely based on small-scale discussion, these overlong parodies are vastly misjudged. Not seeing Trump at all would have made his presence stronger and more dangerous. 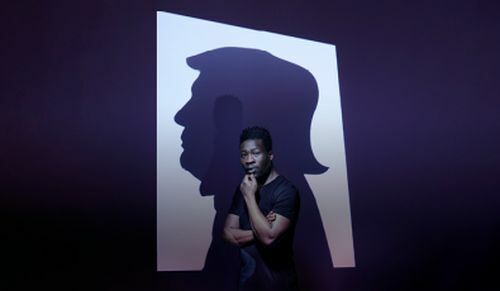 It is a huge shame with so many possibilities in the scenario and script that the first specific Trump play should be such a disappointment, and, despite their excellence with the classics, its hard to remember the last time new writing at the Almeida genuinely astounded (possibly as long ago as Ink). It suffers too from coming so soon after Sweat at the Donmar that has recently earned a deserved West End transfer, Lynn Nottage’s play about disillusion and disenfranchisement in working-class America that manages to be everything Washburn’s play cannot. Shipwreck has its moments and the cast are uniformly excellent, but without strong character investment it dwindles to little more than a few well-hashed arguments we’ve all heard before.